​‘Iterations’ is a dazzling and complex iterative loop. Shapes and lines overlap and affect each other across these loops, culminating in an 8-second loop that retains the flowing qualities associated with straight-ahead full animation with a complexity of movement impossible to achieve through standard techniques. The process for animation was straight ahead from the first frame to the last, working on a single layer, adding to and erasing from the previous loops. Later animation partially destroys earlier sequences, and the final images are sufficiently complex so that individual objects and lines can no longer be completely followed. The Music for Iterations was improvised to the visuals by the animator with musician Anton Flint (Hornell, NY). Iterations was inspired by the work and techniques of Adam K. Beckett (1950-79), an undisputed master of optical printing whose works ('Sausage City', 'Dear Janice') utilize single iterative loops. 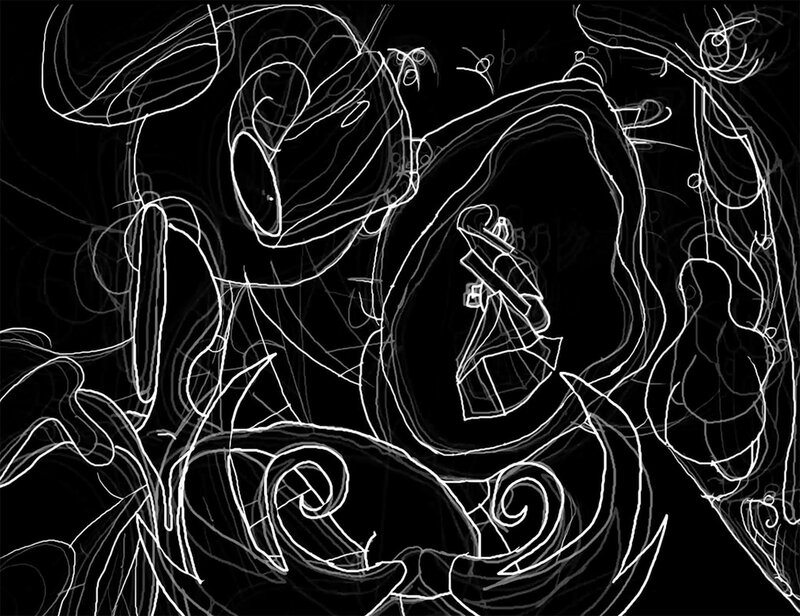 Iterations premiered at the Punto y Raya festival in Karlsruhle, Germany in October 2016, and has since screened internationally, including the Ann Arbor Film Festival, Athens AnimFest, The Berlin Experimental Film Festival, Melbourne International Animation Festival, the New Zealand Film Festival, and was selected for the Louisiana Biennial. Iterations was selected to screen with the ‘best of the fest’ at Animex in Middlesbourough, UK, and was awarded 1st place for experimental film from the Association Internationale du Film d’Animation Eastern US chapter. Jeremy Speed Schwartz is an experimental animator and artisan programmer based in Wayland, New York. His animation work spans experimental stop-motion, hand-drawn and programmatic techniques. As a founding member of the art collective The League of Imaginary Scientists, Jeremy has exhibited animation and interactive works internationally. His recent work with the League includes ‘The Social Cinema Machine’, a collaborative animation made at the Sundance Film Festival in 2017, funded by the Sundance Institute with support from Canon Inc.
Jeremy has been an artist-in residence at the Museum of Contemporary Art in Los Angeles and Signal Culture in Owego, NY. Recent exhibitions include 'Time Pools' at the Art Museum at the University of Memphis, 'The Incredible Balancing Act' at the McNish gallery at Oxnard College, and 'Engineering Entropy' at Bradley University. He is a member of the board of directors for The iotaCenter, an organization dedicated to the preservation and distribution of abstract film and experimental animation. Jeremy is a graduate of the California Institute of the Arts and a professor of Digital Media and Animation at SUNY Alfred.